The village was named after a palm tree called Shaorai. It is situated between the right bank of Sawariwao river and to the left bank of Sawarab creek. It is bordered to the eastern and northern boundaries by the Kanuku mountains. Our community is made up of mix tribe with mostly Macushi and Wapichan. Before our village home steads were up in the mountains at Miri king (Lucas Creek), Bairii wao, and Karan wao. Some names of our first families are Salvador, William, Rodrigues, Lewis Mandook, Felix Alfred, Maurito Joaquim and Edward. The Village has a land has a land title, but it does not secure a large part of our traditional lands. The Village Council has submitted a formal request for extension of our land title under the Amerindian Act, which is currently being processed by the government of Guyana. The results of this application remain pending in 2017. There are two satellite communities next to our main village. There is Mirii wa’o village 4 miles’ east wards of main village and Quaiko village 2 miles west of main village. These satellite communities are overseen by Senior Councillors and reports at General meetings in main village every three months. Quaiko village has a population of 125 people, no church, no school. This village is named after a swamp called quaida (ite palm fruit). Mirii Wa'o village has a population of about 257 persons and it is named after a plant called Mirii. With a Church, Health Post, and sports field. School children attends school in main village and have to ride bicycles and some walk to school every day. Mirii Wa'o satellite residents farm high up in the Kanuku Mountains on customary lands some 15 miles from their home located inside the proposed land title extension area of Shorinab Village. Like any other villagers, farmers have farm camps in distant traditional farming grounds where they have a farmhouse and farm camps. The Village is governed by an elected Village Council and elected Toshao. There are eight councillors responsible for different areas, including agriculture, infrastructure, health, education, environment and youth, sports and culture. Resource areas include Lucas Creek, Karan Wa’o, Baiari Wa’o, Yamat Wa’o, Wabwak Wa’o, Paraka, Totu Wa’o. Our residents also use the forest areas in the Kanuku Mountains for famring, hunting and gathering. The savannah lands are used for cattle grazing, mining pigs and hunting and gathering. 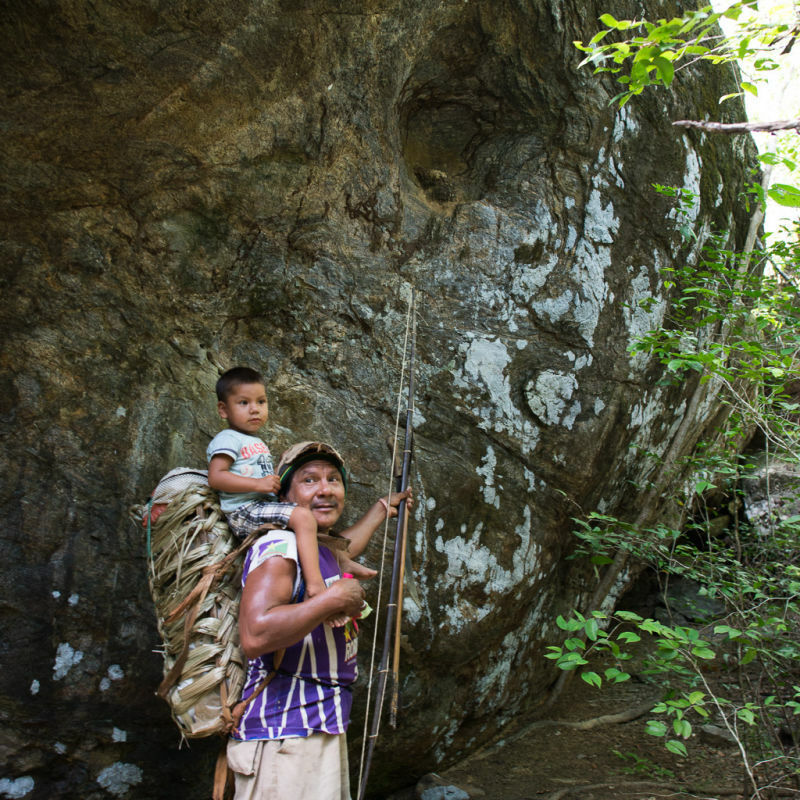 Family members in Shulinab, gathering young kokorite shoot , used for thatching house roofs. Typical community gathering, at a village traditional round house (benab) where leaders, elders, women and children meet. Future plans include work on cattle rearing, farm development and to reoccupy former farming grounds in Lucas Creek. The Village is also exploring options for doing ecotourism in the Kanuku Mountains within our traditional lands. Our land and resources are used according to our customs. We do not supply outside markets and our use of the environment is low intensity. Shorinab Village is an active member of the SRDC sustainable land use management plan, including initiatives to control wild fires and harmful resources use. Our Village lands contain very important cultural Heritage sites that we watch over carefully as they contain the remains of our ancestors and their artifacts. There are many places of high wildlife interest, including rare birds and large animals including jaguars, pumas and harpy eagles. Shorinab has a camera trap scheme that has recorded many of these animals on our lands.